Bedroom Closets: Your Own Oasis! Your bedroom closet should be a place of peace, organization, and beauty. After all, your daily routine begins and ends there. You can count on Tim’s Cabinet Shop to design, craft, and install custom bedroom closets that compliment your space, reflect your style and wardrobe, and fit within your budget. Whether you need a closet organization system for a small closet in a child’s or guest room, or a complete walk-in retrofit in your master suite, we have nearly four decades of experience designing and installing quality custom bedroom closets for satisfied homeowners throughout mid-Michigan. When it comes to custom bedroom closets, we believe in turning organization into art and your closet into an oasis. Our design experts can transform your closet and make space for everything in your wardrobe while completely capturing your style. Your custom bedroom closet will help you easily find what you need so you can take charge of your morning routine and create a feeling of harmony to last throughout the day. Everything in your closet is an expression of you. Your closet system should be no different. Whether you are looking for more space or better organization in any size closet or walk-in, we have the vision and creativity to meet your needs and leave you completely satisfied. By collaborating with our design experts on your custom bedroom closet, your wardrobe will be organized efficiently and designed with a focus on the way you live and dress. Personalized to your needs, we will help you select from material choices, accessories, and elements that reflect your personal style while still fitting within your budget. 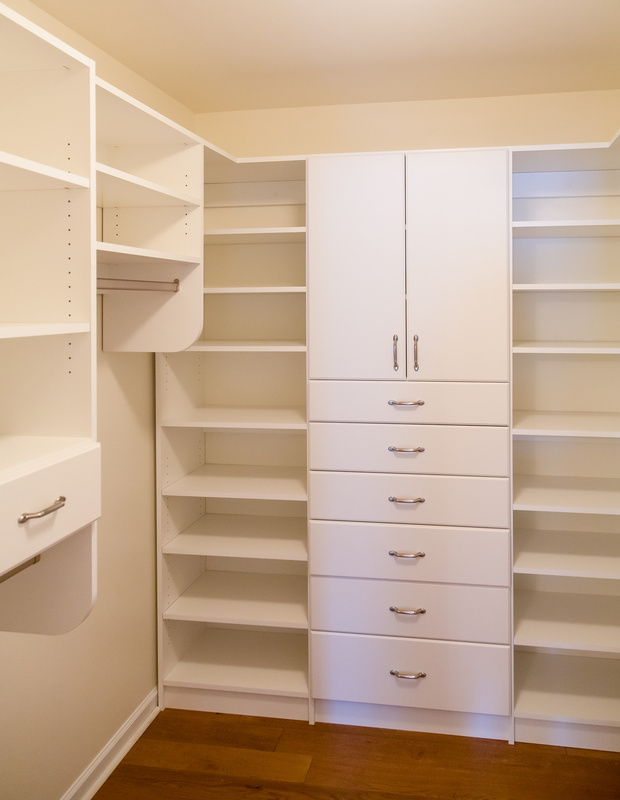 Closet organizers and closet storage systems can help you make the most of limited closet space. You could by the cheap ones at the big-box stores that require cumbersome assembly and mounting, and often fall under disrepair after several years, or you can have us design and install custom, permanent wood organizers that add beauty to your closet and value to your home. A walk-in is more than just a closet. A walk-in is a room of its own. It should reflect your style and compliment your wardrobe. It should invigorate you to start your day as you dress for a new day, and relax you as you slip into your pajamas at the end of the day. Let one of our design experts design and craft your vision for the ideal walk-in closet to match your style and wardrobe. Stop by Tim’s Cabinet Shop at 5309 South Huron Road, Pinconning, MI 48658 or call us at (989) 846-9831 to set up a free design consultation and estimate. Experience for yourself why we have remained mid-Michigan’s premier custom bedroom closet experts for nearly four decades.